A wonderful opportunity! 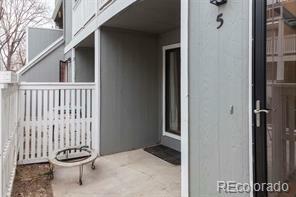 Main floor unit with front patio and back deck! Great room and master bedroom with new wood-laminate flooring giving a light, bright feeling! Full basement with family room/bath/large bedroom are perfect for a roommate to supplement the mortgage! Glass sliders from great room to front patio and from master bedroom to back deck! A great place to entertain; to come home, put up your feet and relax; or go to loads of nearby restaurants for a good dinner! Great amenities in pool and club house are close but not intrusive! The past assessment for exterior upgrades of paint, deck repairs, etc will be paid off by Seller at time of closing. No cost to the Buyer and they get the advantage! A great opportunity to have a private home with 1, 672 sf of finished space for only $220, 000!